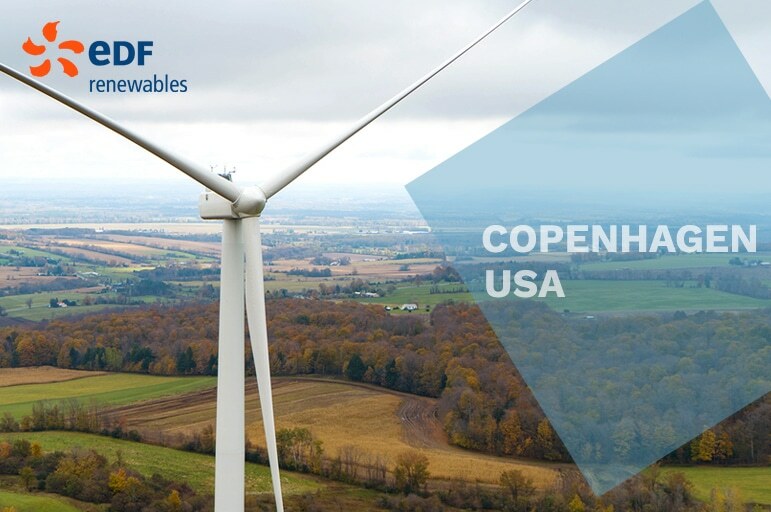 EDF Renewables North America announced today that the 80 megawatt (MW) Copenhagen Wind Project is fully operational and delivering electricity. This new wind farm brings the EDF Group one step closer to meeting its CAP 2030 strategy of doubling its worldwide renewable energy capacity to more than 50 GW between 2015 and 2030. Consisting of 40 wind turbines manufactured by Vestas Wind Systems A/S, the Project benefits from a 15-year Power Purchase Agreement with Narragansett Electric Company, a whollyowned subsidiary of National Grid. Located in Lewis and Jefferson counties in upstate New York, Copenhagen Wind supported approximately 200 jobs during the construction phase. EDF Renewables will perform asset management services to increase project operational performance as well as balance-of-plant, and 24/7/365 remote monitoring and diagnostics from EDF Renewables North America’s San Diego-based Operations Control Center (OCC) to increase equipment availability and reduce downtime. The expected electricity generated at full capacity is enough to meet the consumption of up to 35,000 average homes. This is equivalent to avoiding more than 177,000 metric tons of CO₂ emissions annually1 which represents the greenhouse gas emissions from 37,500 passenger vehicles driven over the course of one year. EDF Renewables is one of the largest renewable energy developers in North America with 15 GW of wind, solar, and storage projects developed throughout the US, Canada and Mexico. Follow us on LinkedIn and on Twitter @EDF_RE in French and @EDF_Renewables in English.